Dan J. Wilson’s Run Raging Rhino Run was more gazelle than rhino at the start of the $20,000 Wheatland Handicap, a move that helped him establish a two length early advantage on the way to a neck victory in the 870-yard test on Saturday at Los Alamitos Race Course. Run Raging Rhino Run covered the 870 yards in :44.856. Bred by WG Racing, he earned $11,000 for the win to take his career earnings to $75,624. This was his ninth win in 25 career starts. He’s won two races and finished second in two other races in his four outings this year. He won the Barbra B Handicap at 550-yards earlier this year. 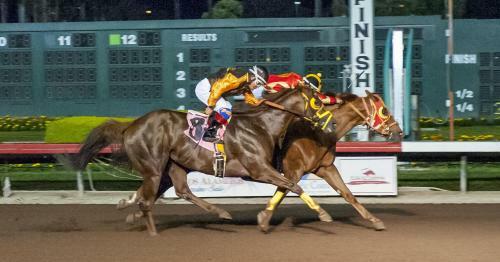 Gonzalez is now seven wins away from 700 Quarter Horse victories in his career at Los Alamitos. Robert Bean’s Candy Zip, a convincing winner in the Rossmoor, was seventh at the start before mounting his challenge in the final 300 yards. He came up just short of victory, but he earned $4,500 for his solid second place finish. Candy Zip has now earned $80,873. Turn Your Eyes, Papa G, Foxy Fresh, Bound To Bet, Newport Coaster and El Koreano completed the field.